A. Tax rates are going up for most of us. Married filing joint returns, with income in excess of $450,000, may have tax rates as high as 43.50%. B. There are also changes limiting itemized deductions for individuals earning more than $250,000. C. Capital gains tax rates have been increased from 15% to 20 - 23.8% based on income. The tax rate on dividends, interest income and passive income also increased to 23.8%. D. The personal exemption is being phased out. For single taxpayers, it begins at $400,000 and $450,000 for joint returns. When you add to these, the increase in Medicare of 3.8%, the increase in investment income taxes, the phase out of itemized deductions and exemptions, and add state taxes, you will be paying taxes of 50% or more on your income. If you can deduct horse-related losses, you will reduce your taxes by 50%. E. The Internal Revenue Service (IRS) will be scrutinizing more horse owners. To successfully withstand this scrutiny and be able to deduct your horse-related expenses, you will have a more difficult challenge of proving you satisfy the “9 point test.” You will need to prove that you are actively involved, have a competent and knowledgeable team, meet the qualified hours test and prove you are conducting your horse operations as a real business, and not as a hobby. F. The estate tax law exemption is now $5,250,000 and the tax rate is 40%. There is also portability of the unused portion to the surviving spouse, plus a $14,000 annual gift. You certainly want to take advantage of discounts in valuations of your estate which are available to you in the horse industry. G. The costs for trainers, veterinarians and suppliers of materials are also increasing. Those costs are passed on to the owners making the costs of running the stables more expensive. A. The special depreciation allowance (bonus depreciation under IRC Section 179), was extended and it allows you to realize an immediate tax deduction on the first $500,000 of purchases of horse-related capital assets. These can include two-year olds, weanlings, equipment and broodmares. However, if your purchases exceed $2,000,000, you will lose $1 of the IRC Section 179 tax benefit for every $1 over $2,000,000. B. Any costs not expensed under IRC Section 179, if it pertains to a racehorse 24 months and under, will now be subject to a 3 year depreciation schedule and 62.5% of the cost can be depreciated in the first two years. It was previously only 29.5%. C. A tax deduction that is often overlooked involves the purchase of broodmares. The most popular method to purchase breeding rights to a stallion is what is called live foal breedings, stand and nurse. However, in most breeding contracts, when a mare is entered into a sale, the breeding right converts to a “no guarantee season.” Many of our clients elect to segregate the stud fee from the mare cost. Therefore, when you purchase a mare that is in foal, the stud fee would be immediately tax deductible and not figured into the $500,000 limit. D. The work opportunity tax credit was extended into 2013. E. The alternative minimum tax (AMT) is permanently set at $50,600 (single) and $78,750 (joint) filers with annual cost of living adjustments. More and more audits are incurring as the IRS attempts to raise more tax dollars. Do they have over 400 industry clients and are considered the leading accounting firm in the United States for the horse industry? Have they successfully handled over 100 revenue examinations? Are they CPAs who specialize in both the business and tax aspects of the horse industry and have over 400 horse clients? Does your CPA teach entrepreneurship at the #1 College in entrepreneurship in the United States, Babson College? Do they own 100 horses and have they won over 1,300 races? Did they co-breed two horses that were in this year’s Breeder’s Cup? 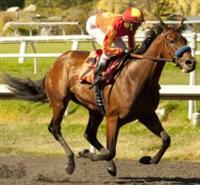 One, Executiveprivilege, is a favorite to win the Eclipse Award as the best two-year old filly? Did they have a horse that ran in the Kentucky Derby? Did they win the leading owners award on three occasions at different tracks? A. Diversify the type of horse you own to increase your opportunities to make money. Buy two-year olds, yearlings and weanlings and select some who are bred to run early and others who have distance pedigrees. B. Purchase fillies so you have the additional alternative of breeding them. C. Buy percentages of horses “from partnerships.” Owning 25% of four (4) horses materially increases your chances one will be successful versus buying 100% of one horse. Many partnerships buy higher quality and more expensive horses that you can individually afford. Again, the potential for a big winner is not a direct correlation of the cost of a horse, but statistically the chances are potentially better. Some of the better known and more successful syndications and partnerships include Valor Racing, West Point and Dogwood. Also, a number of trainers, consignors and pinhookers have formed partnerships with some of their owners. I have always found the horse industry to be very exciting. If you maximize your tax deductions and utilize them to reduce your taxes, it allows time to plan for long-term success. If you believe we, at The Green Group, can assist you, please call one of our Thoroughbred Niche Team members at 732-634-5100 or visit us at our website www.greenco.com. Pursuant to IRS Circular 230 regulation: "Any tax advice expressed was not intended or written to be used, and cannot be used, by any taxpayer, for the purpose of avoiding penalties that may be imposed on the taxpayer. If this advice was written to support the promotion or marketing of partnership or other entity, investment plan, or arrangement to any taxpayer then the advice was written to support the promotion or marketing of the matters addressed by the written advice and the taxpayer should seek advice based on the taxpayer's particular circumstances from an independent tax advisor."